hip and management, operating on broad, metre and narrow gauge networks. In 1900 the government took over the GIPR network, while the company continued to manage it. 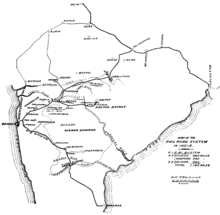 In the First World War, the railways were used to transport troops and grains to the ports of Bombay and Karachi en route to Britain, Mesopotamia, and East Africa. With shipments of equipment and parts from Britain curtailed, maintenance became much more difficult; critical workers entered the army; workshops were converted to making artillery; some locomotives and cars were shipped to the Middle East. The railways could barely keep up with the increased demand. By the end of the war, the railways had deteriorated for lack of maintenance and were not profitable. In 1923, both GIPR and EIR were nationalised. "The most magnificent railway station in the world." Victoria Terminus, Bombay, was completed in 1888. Headrick shows that until the 1930s, both the Raj lines and the private companies hired only European supervisors, civil engineers, and even operating personnel, such as locomotive engineers. The government's Stores Policy required that bids on railway contracts be made to the India Office in London, shutting out most Indian firms. The railway companies purchased most of their hardware and parts in Britain. There were railway maintenance workshops in India, but they were rarely allowed to manufacture or repair locomotives. TISCO steel could not obtain orders for rails until the war emergency. The Second World War severely crippled the railways as rolling stock was diverted to the Middle East, and the railway workshops were converted into munitions workshops. After independence in 1947, forty-two separate railway systems, including thirty-two lines owned by the former Indian princely states, were amalgamated to form a single nationalised unit named the Indian Railways.